When I can’t get my favorite scones from Petite Madeline Bakery in Oceanside, CA, I resort to a good alternative. Chopped fresh borage leaves melded perfectly with lemon zest for a light and moist scone combining mild cucumber and citrus flavors. 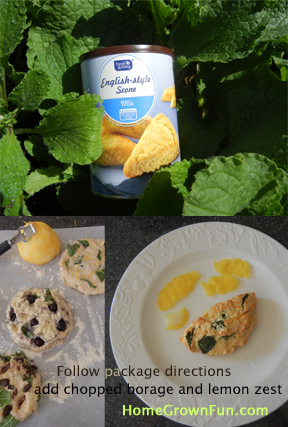 We discovered Fresh & Easy’s English-Style Scone Mix. It has no artificial preservatives, flavors or colors. What a relaxing morning, enjoying the scones with a glass of iced borage tea. To make the tea, steep a leaf of borage in hot water and pour over ice. Mix with earl grey for a refreshing morning pick me up.